Today marks a major milestone for Majestic. Some people may have THOUGHT we were launching things regularly over the last year – but this will take search optimization technology tools to the next level. Majestic SEO are pleased to announce the alpha of our Search Explorer™, a specialized search engine which ranks pages based on how influential on the web graph they are based on a given search phrase. Initially launching with a large search dictionary of mainly English search terms (and on a subset of our data only), Marketers will be able to see new and realistic search results (SERPS) based on a global crawl. Over the coming months, Majestic SEO plans to extend Search Explorer™ to dramatically increase the search phrases and also to improve the accuracy of the results, which stem from our Flow Metrics™ algorithms. Did Majestic Just Launch a Search Engine? Why use Search Explorer™ instead of Bing or Google? Majestic SEO’s primary audience is the SEO industry. In particular, SEOs like to see the back link profile of a website or web page to be able to see how those links might influence the site’s search position. However, showing influence without context is only showing a third of the story. On page optimization has been well understood by the SEO industry for years and is another also third of the story. The last third of the story has never been told because only the likes of Bing and Google have had the scale to be able to contextualize the link data until now. In other words, it is the CONTEXT that turns a link crawler into relevant and meaningful search results. Further layers of data, such as on page optimization or personalization seek to give relevancy to search, but in doing so, the results in the mainstream search engines obfuscate the ability to see how links influence the search engines. Transparent Search: Search Explorer™ is making that guesswork a thing of the past. Majestic does NOT use data from the major search engines in any way and has created its own algorithms. It is therefore able to show you search results which are transparent and can do so at scale. Advertisement Free: Because Majestic SEO is subscriber based, rather than advertiser based, you will never see advertising or pay-for-placement results polluting the data set. Search API: Majestic SEO provides a full API to Platinum account holders and above, allowing these users to look at our rankings at scale without the need to scrape the data inefficiently. No Personalization: Non-Personalized data and no third party cookies means that the data is clean and ideal for independent research. Better Granulation: By giving users the option to sort by URL OR Sub-domain OR root domain, users will be able to better interpret our SERPs to see the results that are meaningful to them. Majestic’s Search Explorer is bound to initially be used for link prospecting straight out of the box. Put your target keywords into Search Explorer as soon as you can to start seeing results sooner. Majestic SEO has launched initially with a large but limited search terms dictionary. By searching for terms not yet in our dictionary, you can help to guide how we build Search Explorer. When did Majestic start to Think about Search? We may not have talked about it very loudly, but Majestic created a full text search engine way back in 2005 with 1 bln full text indexed by March 2006. However, when Alex created this the first time round, he realized that the web graph, rather than on page factors was the key to developing a scalable search product. Luckily, there was a viable business model for us to develop with out link data whilst we worked on this scale. 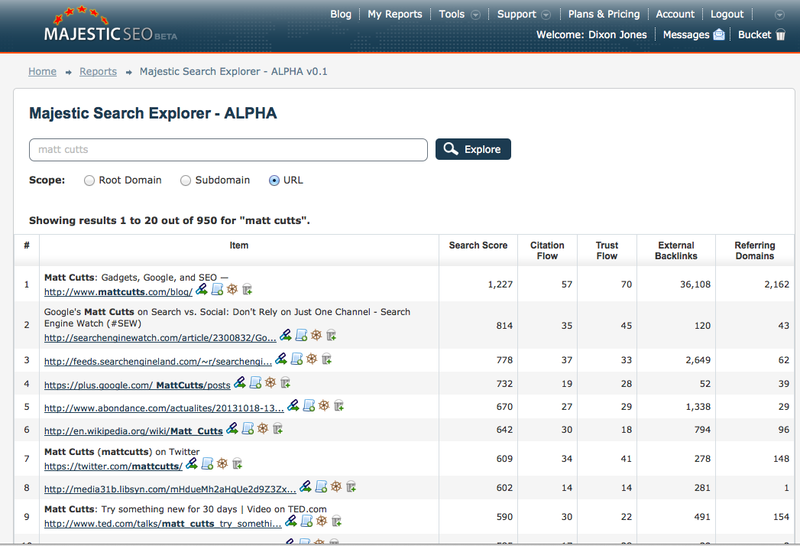 How BIG is Majestic SEO’s Search Explorer? Because Search Explorer is a self learning system, the data will expand very rapidly, probably faster than we can count it. Majestic calculates rankings for every search phrase that you request as a user – but only after you have made the request for the first time. So whilst at the start you may not see search results for terms that interest you, all search queries will automatically be added to our indexing cycle. We will then calculate the flow metrics associated with that term and we will be able to return data the next time you search! This self learning methodology allows Majestic to concentrate on the search terms YOU want to analyze, without having to worry about search results that nobody will ever search for. The more people use Majestic Search Explorer, the better it will be! Will Enough People use Majestic? We already do… and importantly they search at scale, adding large amount of queries at the same time. Outside the English language our initial dictionary is considerably smaller, but as the site itself is already multilingual, we will be looking to expand those dictionaries either organically or through dictionary licensing partners over the coming months. Also – because Majestic is not trying to succeed through an advertising based business model, we feel no need to compete with the mainstream search companies for marketing share. Remember that we are only in Alpha with a subset of data at this time, but just type in a search phrase at MajesticSEO.com – like this one. What an interesting concept – an independent search engine with its own algorithm and sorting options. I’m assuming that social factors don’t influence results? I’ll check this feature out, so thanks for sharing! When the data sets become more refined that’s when we can get a clear idea of even how a particular campaign is performing for instance. And social data integration would be like an icing on the cake. What a brilliant idea! Whilst I don’t hate Google like some SEOs seem to be moving toward, I would like there to be another viable competitor enter the market place in the future. I didn’t find a call for this in the API reference. Is this coming soon? We’ll get it documented in a week or so, it will be available! > Is this documentation available? I also need this information. what about to have the SERP in function of one country ? Wel’ll add GEO bias shortly – it will be possible to control it (ie – turn it off or force bias for specific country). Excellent job Majestic team, this is what we need, Looks the best tool for sites analysis. Interesting but not clear what signals Search Explorer takes into consideration. I’m not asking you to unveil the algorithm you use but are the results purely based on the link graph, onsite relevance or both? At the moment, our data is based on relatively few factors. Anchor text, Page titles, URls… Back in 2006 we realized that until you could “picture” the web universe… or at least most of it… you would be unlikely to sort the wheat from the chaff. So we have been working on the scale issue for over 6 years since. Now that we have (hopefully) cracked that part of the puzzle, we of course would like to look at how we might tweak the initial results. So it sounds that you rely on a few basic onsite factors and no offsite ones (e.g. links)? IMO, things have significantly moved on since 2006 and I fail to see how anchor text, page titles and URIs can help sort the wheat from the chaff, without looking into the actual page content. I’d love to start using the new service but having read the blog post and the previous comment I struggle to figure out how the service can be useful if it’s missing the two main components of the web’s universe: links and content. Our service uses links and small amount of on-page content such as HTML Title of the page and inURL matches also. Will that be enough to rank well? We’ll soon find out! Is Search Explorer using fresh index or historic index ? We use fresh data at the moment. It looks great although we don’t come up for our search. Please use Feedback button on the search page which did not return results you expected, please provide some URLs with what you think should have been there, thanks! How is it that the search score is calculated? Are there scores assigned for relevant anchor text and page titles? And does that anchor text have fuzzy match (for plurals or misspellings, say)? The only reason that this confuses me is that I can be looking at a page where the shown metrics (Citation, Trust, Referring Domains and Backlinks) can be objectively superior to the top results, and the page itself has been optimised for that given keyword – And it won’t show in the results. I would assume this might be a domain authority thing where the higher rated pages just have better domains on the whole, though I wouldn’t like to jump to that conclusion without confirmation. I’d love to get use out of this but I think until I understand how it figures everything out I’m just going to get confused! Bear in mind this is Alpha, produced to go live for Pubcon. We can now start looking at the algo options, but out of the box we are pretty encouraged so for. Search score is based on Flow metrics, inURL, inTitle and inAnchor data to start, but we have plenty of ways to work on the data now that we have the infrastructure to be able to build this at scale. Who will be the Google out taker? Looking forward to use this tool. Wonder to see how google will respond. Great addition to your already super service to the SEO fraternity. I have been using the url search facility on a regular basis almost from when you started and over the years have seen your service grow from small seeds to what is now a complete one stop shop for anyone involved in internet marketing and in particular SEO. Looking forward to using your system even more now that you have added this great new facility. Thanks Geoff. It’s got a way to go, but the early signs are encouraging. Hey Dixon, this is just freakin’ great. One more reason why Majestic is so much better than Moz. To be fair, Moz also have loads of other tools (and an awesome community) that we are never likely to build! They actually launched something last week too, regarding new mentions, but it is certainly a different direction to us. But that said – THANKS Nathan! We think this is pretty big news and even though we are only in an alpha, we should be able to make it better from here. Sounds great! Are there any plans for localised search? At a country level, we will be able to make some improvements – but I can’t say when. Hi, Congrats for the achievement and best wishes for the success. But that said, unregistered users can (for the moment) get 10 results free. But that is not our target market. I would pay for an advertising free fulltext search engine wich respects my privacy and is not selling out my Data. Given the NSA scandal, i think many companies might favour a paid serchengine instead a data sniffing free one. Especially when Advertising is distracting employees form their work and so on. Even Majestic’s own Web analytics on the site is using Piwik so we can keep our own site data rather than trust a third party. Unfortunately, most of our users come in using Google Chrome, so they are trackable anyway. We can only do our part in that privacy process. Given the history I am surprised you resisted the temptation to do this for so long, but I guess you answered that one already. 🙂 It has been quite a journey to get this far. I think we will walk before we try to run. Our next challenge is increasing the size of the data set that we are searching through. That should be OK as we have this data, but need to connect dots and do “stuff” that is outside my job description. But you have the right idea. It is very interesting news from you guys ! I look forward to using your search engine instead of google or bing. Thanks! I think you may be waiting a while for that though! Thanks for your clarification in post # 8. Also, will you be adding other metrics down the road such as Moz Trust and Moz Rank (or similar other authority measures besides just Citation Flow and Trust Flow)? Looking forward to seeing your new explorer gain more traction in the industry. I doubt that. Moz generates moz data, we generate and own Flow Metrics (including the trade mark) and we get these from first principals. We also would not try to use PageRank as that is also owned by (in fact) Stanford university I believe. I have been trying the tool and I can see its potential and already see good results. However I am missing the geo localization options..are there any plans to implement Geo options? that would be fantastic. There are a few technical hurdles to ump through to get this option, but certainly we hear you loud and clear and would also like that functionality.